Born 1946 in Terrassa, Spain. Lives and works in Barcelona. Eulàlia Grau was a pioneer artist in the development of feminist art in Spain. In her photomontages she criticised the ideological and repressive forces of capitalist society. After studying fine art and cinema, and having worked in Milan for a design studio, Grau conceived her first series of works, Ethnographies, in 1973. Using the technique of photomontage, extracting images from the press and recomposing the conflicting fragments, she created a political commentary on the reality that surrounded her. Grau’s work denounces the contradictions of Francisco Franco’s regime and the capitalist mass-consumption society. 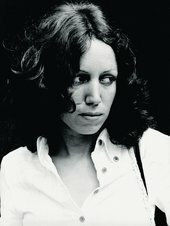 Revealing the manipulative processes behind press advertisements, she tackled the deepest issues of a male-dominated and repressive society, advocating a rebalance of powers, notably through women’s liberation from their subordinated role as promoted by the mass media. The title of Eulàlia Grau’s Ethnographies 1972–3 series suggests the description of a human group’s habits, traditions and way of life, and she analysed the multiple facets of Spanish society under Franco’s repressive dictatorship. The juxtaposition of sharp contrasted images captures a condensed portrayal of excesses, clichés and contradictions of society in the early 1970s as presented and trivialised by the mass media. Grau’s analysis covered all aspects of society: the alienation of women in the confined domestic sphere and in the institution of marriage, women’s sexuality and abortion, the male-dominated political sphere, the advertisement diktat that imposes idealised bodies, the futility and artificiality of ephemeral fame, sports and beauty celebrities, the horrors of commercial and political wars, and the outrageous discrepancies between social classes. As feminist and critical commentaries, Grau’s Ethnographies appropriate the language of mass-media society in order to reveal its failures and, more generally, the failures of society as a whole. Interview with the artist Eulàlia Grau, included in the World Goes Pop exhibition at Tate Modern.